Rockman Corner: Duck and Cover, It's Mighty No. 8! why can't a woman be a "classic gunman"? IntiCreates used a character archetype associated with a male character when they created Atlas in the ZX series. This seems like a wasted opportunity to get more female representation in the game. Now we've only got one. I'm rather disappointed. But now one female robot can shine above them all. She will be unique on her own. Same reason why Splash WOman was all by herself. I can sort of agree, but I cannot see this as a female character. ^^; I would still love to see more female characters in the future. In other words she can be the Smurfette. Hint: While it's marginally better than an all male cast, it's not really a good thing. I do like this character's design, though. Unless he has an arm with a hand hiding under the poncho, it's going to be awfully tough to throw that dart in his mouth. Proof a character like this could easily be a female character. The first person who came to mind when I saw this was Clint Eastwood. Great design, and I don't even like Western films! I love the variety of designs we're seeing. I am glad that they decided that it is going to be male instead of female. 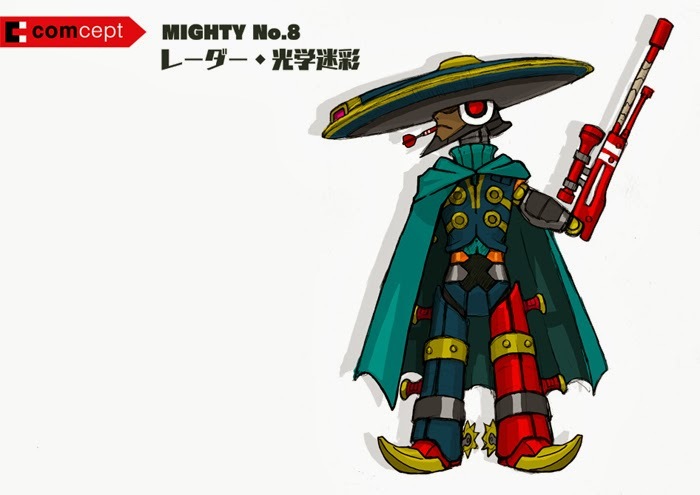 Very western style looking and awesome design! Even if this were a female character, the male enemies would out number them three to one (instead of 7 to one). And yes, I understand why there were no female characters in most of the original Mega Man series. It was a different time. But this game is new. Women make up half of the population. There's no reason why we should have to settle for token representation. Before anyone starts complaining about how women can't be sharpshooters, look up Annie Oakley and Lyudmila Pavlichenko. Honestly, I don't give a damn if this character could have been female or not. We have one female robot, and while more would be nice, I'm rather content with the one we already have. Either way, this is one interesting design. I love how they're exploring many different opportunities in design with this game. Am I the only guy who is reminded of searchman(.exe) after seeing this guy?